Memorial Northwest subdivision is located in Spring Texas. West of I-45 and connected via Louetta Road at Champion Forest Drive Residents can easily access downtown Houston, Bush Intercontinental Airport, shopping, entertainment, and sports venues. 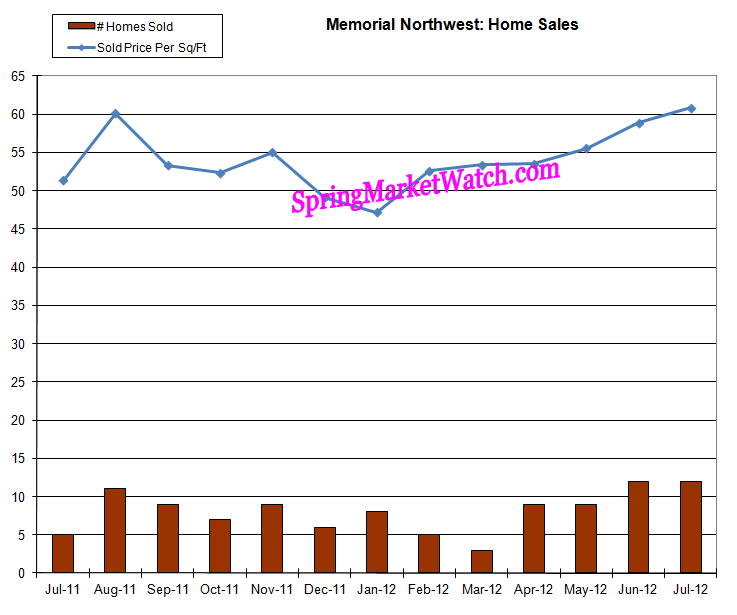 The following graph depicts the market activity for sold homes, Memorial Northwest for the last year. There are 2122 homes in the Memorial Northwest neighborhood. Community Amenities include a community center, 12 tennis courts, An Olympic size swimming pool and Fitness center. Community sponsored events include annual children’s Easter Egg Hunt, Memorial Day Swim event, 4th of July Parade, Labor Day event, Breakfast with Santa, and New Year’s Eve Party. Community activities and organizations include a community swim team, His and Her Tennis Leagues, Private Tennis lessons and more. If you’re interested in searching for a home in a different neighborhood, you can do so here, by simply typing the neighborhood name into the “subdivision” box. ***If you are considering a new construction home, I highly recommend you take a take a Realtor with you that knows how to negotiate builder pricing, to represent your interest in the transaction. Statistically buyers who work with a Realtor when purchasing a new home get a better deal. Don’t forget that the Sales counselors work for the builders and their job is to sell you a home for highest price they can. This entry was posted in Memorial Northwest, Neighborhoods and tagged average home price, average price, average sales price, Homes in Memorial Northwest, Kimberly Whaley, Kimberly Whaley Real estate, kimberly whaley realtor, klein, Klein ISD, Klein School District, Memorial Northwest, Memorial Northwest homes, Memorial Northwest homes for sale, Memorial Northwest Real Estate, memorial Northwest spring Texas, recent home sales, recent sales, spring homes, Spring homes for sale, Spring Texas, spring texas real estate. Bookmark the permalink.